The All India Gorkha League (AIGL) observed the fifth death anniversary of its slain leader Madan Tamang on Thursday in Darjeeling at the very spot where he was hacked to death in broad daylight on May 21, 2010. Party leaders in their speeches rued the lack of apathy shown by the West Bengal government and the investigating agency in speeding the process to provide justice even after five years since the murder had taken place. to demand for judicial inquiry into their leader’s murder. “We will seek support of likeminded political parties of the hills first and then demand judicial inquiry into our leader’s murder,” he said. 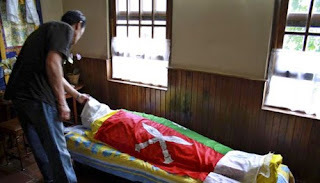 Tamang, the AIGL president was hacked to death in the morning of May 21, 2010 at the Upper Clubside area of the town while overseeing preparation for a public meeting on that fateful day. The AIGL leader’s murder case was initially handled by the CID; however, it was taken over by the CBI but the investigation has failed to yield much result. Bharati Tamang, the slain leader’s wife in 2012 had filed a petition in the Supreme Court questioning the slow investigation by the CBI and had demanded for a special investigation team into her husband’s murder. “Impartial investigation has not been done by the agencies presently handling the case. We want nothing but the truth to come to light and those involved brought to justice,” Pradhan said. The CID had named 30 Gorkha Janmukti Morcha (GJM) supporters and leaders in their charge-sheet. Prime accused Nicole Tamang, a GJM central committee leader, was arrested in August 2010 but mysteriously managed to abscond from Pintail Village, a government guest house near Siliguri, while being interrogated. All others named in the charge sheet are presently out in bail apart from Nicole and Dinesh Subba who are absconding and a third person Sangey Yolmo who is in hospital. Dil Kumar Rai also named in the charge sheet was murdered at Goradura on the way to Singla tea estate, on December 28, 2011.